The first sequel to the 1984 slasher flick immediately drops into routine territory and bland execution. 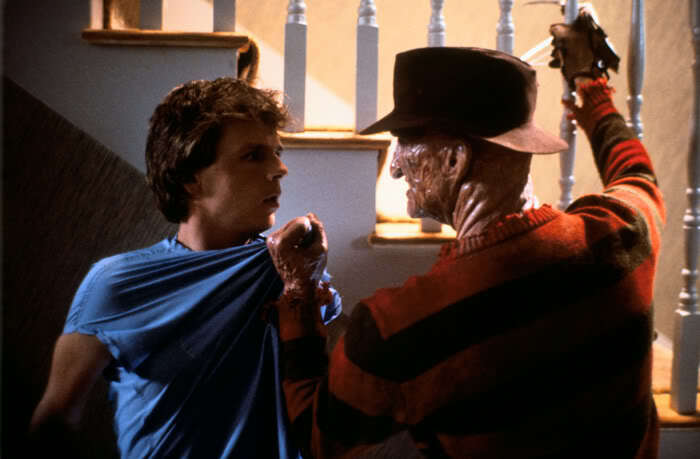 A Nightmare On Elm Street 2: Freddy's Revenge is neither scary nor fun, just pointless. Five years after the events of the original film, the oblivious Walsh family has moved into the house where a teenager was terrorized by deadly nightmares featuring Freddy Krueger (Robert Englund). High school teenager Jesse Walsh (Mark Patton) now starts to experience horrific dreams, Freddy coming to him and insisting that Jesse needs to kill in real life at Freddy's behest. Jesse's parents Ken and Cheryl (Clu Gulager and Hope Lange) don't believe him, and initially, neither do his friends Lisa (Kim Meyers) and Ron (Robert Rusler). People around Jesse start to die, including his abusive athletics coach Schneider (Marshall Bell). Freddy is able to take control of Jesse's body to commit gruesome acts, and both Ron and Lisa are endangered. Lisa tries to help by exploring the old power plant where Freddy used to work, and Freddy then crashes Lisa's pool party, leading to a final confrontation where Lisa tries to help Jesse regain control of his body and evict Freddy. A desperate mishmash of ideas leading nowhere, Freddy's Revenge lacks any style and innovation, and suffers from a brain-dead script by David Chaskin and awful performances by an inept cast. Allowing Freddy to leap into the waking world through Jesse's body undermines the whole premise of the first movie. Some of the targets that Freddy chooses to harm, such as Schneider, are also incomprehensible if Freddy's intent is to avenge the community of parents who originally burned him to a crisp by killing off their kids. Youngsters Patton, Myers and Rusler read their lines with studied amateurishness, while Gulager (13 years on from The Last Picture Show) and Lange get to discover how low Hollywood's career ladder can descend. Director Jack Sholder can't come close to matching Wes Craven's relative artistry, and instead delivers rehashed scenes that fail to generate any sense of suspense. Stretching to a tiresome 91 minutes, A Nightmare On Elm Street 2: Freddy's Revenge is a dish served bored.